Only Table Tops now offers a table top surface for the clean freak in all of us. Resistant to fingerprints, smudges, smears. AND truly amazing to the touch, Wilsonart Traceless Laminates are the newest most exciting surface choice available today! Tackling troublesome fingerprints, Wilsonart Traceless Laminate is a high-tech, fingerprint-resistant material that repels smudges and streaks. The technology is infused into the laminate during the manufacturing process, making it part of the product rather than a top coat. It also comes with UL GREENGUARD Gold certification for low chemical emissions. Traceless Laminate debuts with five neutral tone patterns. “Greatest thing since sliced bread” ~ Drew de Weerd President of Only Table Tops. 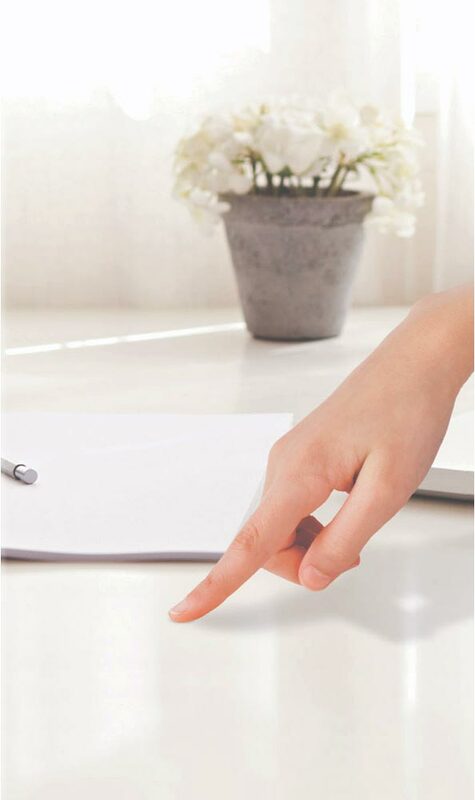 The new “Traceless” surface can be touched without leaving any traces. A special coating process permanently protects the surface from marks, making it much easier to keep clean. Special lacquers are used to reduce the material’s thermal conductivity so as to prevent visible condensation from forming on the surface. Developed specifically for this purpose, “Traceless” benefits from a micro structure that makes marks almost invisible. Launched earlier this year, Wilsonart Traceless is already proving hugely popular with interior designers and architects. The super matt smooth finish laminate is now available in eleven popular shades. Wilsonart Traceless is a decorative laminate that can be used in the most demanding interior design applications, where design flexibility is paramount. This unique technology ensures that finger marks are almost never seen thereby substantially reducing the effort required for care & maintenance. Available in HPL with short lead times, this stunning yet highly durable smooth surface is impact, scratch & heat resistant. It does not stain & is easy to clean, making it the perfect choice for your interior commercial space design. Only Table Tops has spotted several additional colors available on the Australian Wilsonart website and hope that more will become available here in the United States as well. Looking Forward to Seeing Everyone at The NeoCon 50 Show! Drew and Jacie from Only Table Tops will be attending the show and awaiting a booth number. Architects, designers, and office furniture dealers looking for a table top manufacturer, browse over 807 available colors, 18 standard shapes, and many other custom options. Only Table Tops has the new WilsonArt Traceless surfaces you’ve been waiting for. Order now: Wilsonart Traceless Table Tops from Only Table Tops in Phoenix AZ USA. Made-to-order, faster turnaround, precision made in USA without the blemishes. Custom Table Tops at Dealer Prices. Interior designers across the U.S. rely on Only Table Tops for just-in-time manufacturing and custom order table tops for many reasons. Our highly trained staff are considered the experts in the industry, and our sales and customer service teams are highly knowledgeable and here to answer any question you might have. Let Us Quote Your Next Commercial Design Project. Call 602-845-9334 to learn more. Exceptional Quality Table Tops at a Fair Price. Only Table Tops is the industry’s trusted source for commercial table tops and work surfaces in any shape, size or color. Our manufacturing facility in Phoenix Arizona is uniquely designed to craft thousands of table tops each week with precision and craftsmanship unseen in the industry. We also have many unique services and options that you have been searching for. Only Table Tops specializes in special order table top manufacturing to your specifications. Check out over 807 colors, wood grains, and designs.